Climate change has had the most noticeable and significant impacts on Pacific Islands nation as seal level rise increasingly reduces the land mass of the islands and they are left vulnerable to salt water contamination and land that is unable to sustain vegetation growth. 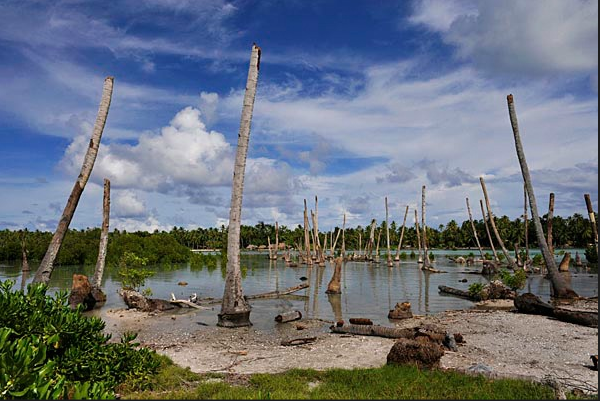 Scientists predict that island nations such as Kiribati will completely disappear by 2050. The government of Kiribati is currently faced with the reality that within the century their land will no longer be habitable and they must relocate the entire population. Threat to sustainability is not limited to sea level rise but also in the way urban areas are managed, such as adequate sanitation facilities and access to fresh water has had an impact on the islands. The greatest social tensions and challenges are concentrated in South Tarawa. Especially in South Tarawa, where a population of 40,000 is crammed into less than 15 km of land mass, the fresh water supply is greatly strained through overuse, improper waste management and rising sea levels contributing to the salinity of water supplies. 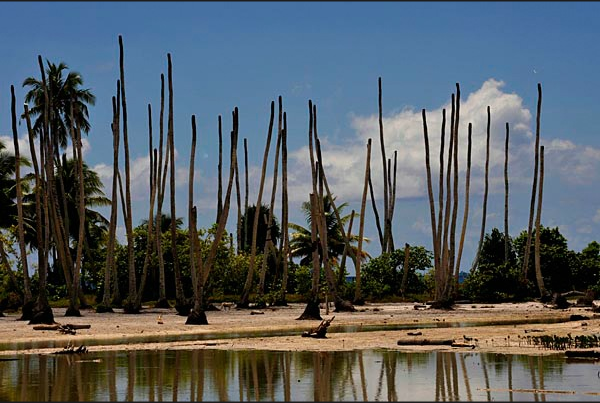 The most visible effects of water salination in South Tarawa is the dying plant life. Dead palms trees dot the coastline of South Tarawa and other agricultural crops for food consumption will not grow in the soil. 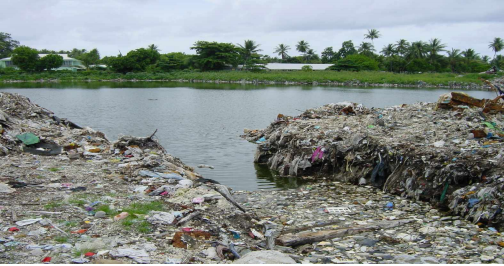 There are high levels of lagoon pollution due to insufficient sewage systems. The infrastructure of Kiribati especially in the island of South Tarawa is under immense tension due to sea level rise. 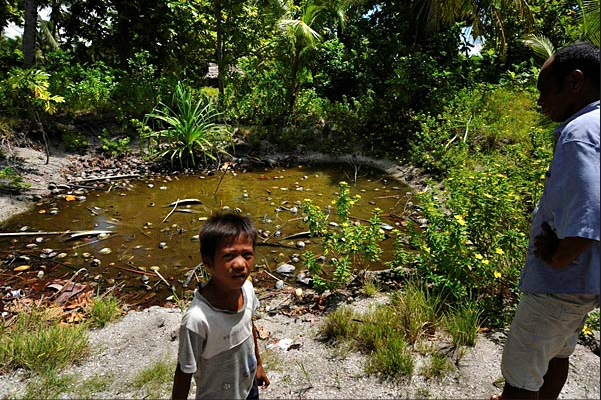 Most of the houses lack modern sanitation and are not connected to the town sewage system and extreme weather conditions and high tides routinely contaminate the ground water. 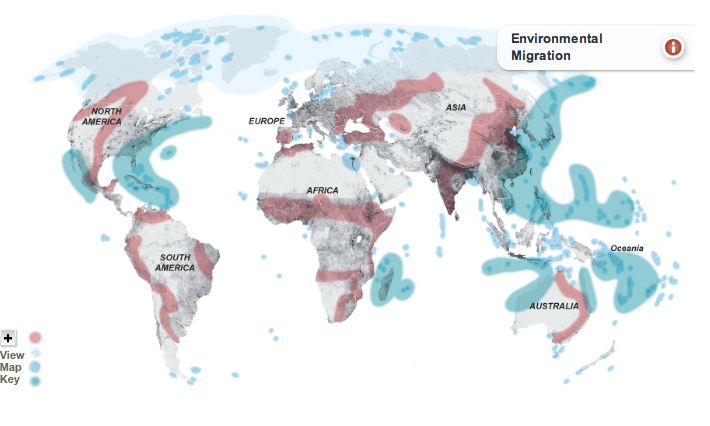 sea level rise, which has been cited as the primary cause for migration. Kiribati citizens have witnessed sea level rise and a surge in tropical storms and more forceful tides over the past 40 years. Groundwater contamination was first reported in the late 1970s and was then followed by erosion and more instances of houses falling into the sea. The government eventually gave up on repairing many of the sea walls bordering the island of Abaiang giving most villagers the only option of relocating. The Republic of Kiribati is located in the Pacific Ocean and is consisted of 33 coral atolls many of which lay 1 meter above sea level. 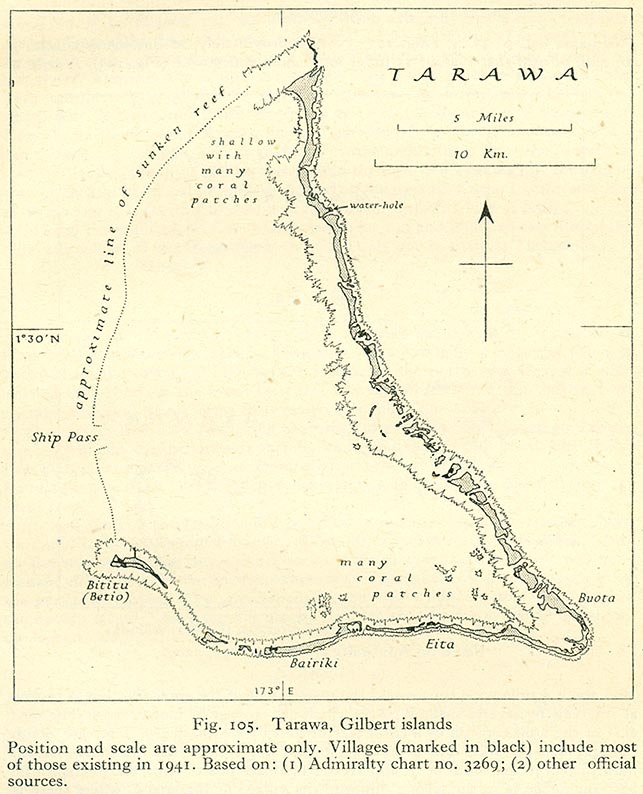 This case study focuses on the two most populated islands of South Tarawa and Abaiang. 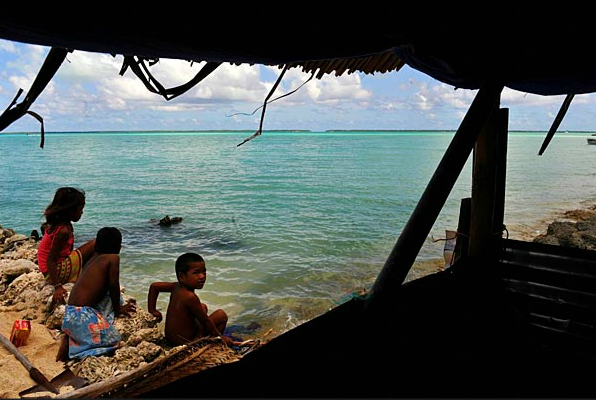 Kiribati is dependent on assistance from international actors for socio-economic development. Their dependency on their international neighbors will most likely increase in the future because of the need to protect against the impacts of climate change that may degradate its infrastructure and environmental resources. The Citizens of Kiribati acknowledged the negative impacts on the people of the Pacific Islands through the Otin Taai Declaration. However, many are reluctant to accept the scientific explanations for climate change and relate the impacts as acts of God. 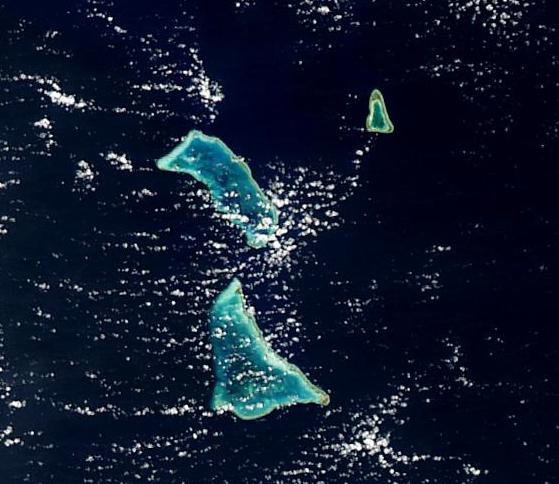 Similarly, some people of Kiribati believe that the island is safe because the bible assures that “there would never again be a flood like the one experienced by Noah”. 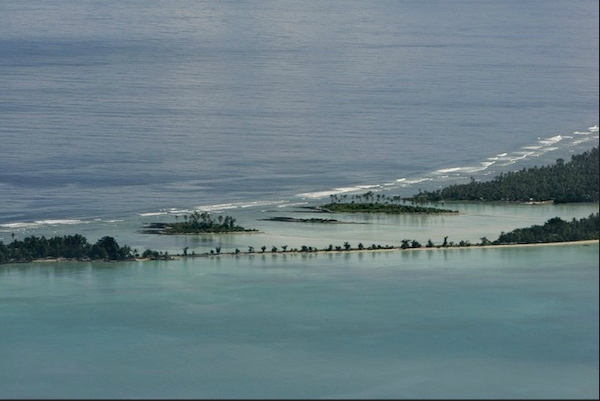 Institutions such as the European Union, AusAID, and NZAID have invested in adaptation projects to help Kiribati and increase global awareness about sea level rise and the threat to Pacific Island Nations. President Anote Tong has spoke on the matter of relocation at the United Nations and is overall concerned with the whole survival of the island its ability to feed itself over the next 50 years. The President would like the countries contributing the most to climate change to take action and accept responsibility for the country's impending demise. Some agricultural research organizations have begun experiments to aid Kiribati's agricultural fertility by breeding food that can grow better in hotter weather and saltier water. Video: Worst case scenario of the effect of a 1.4 meter sea level rise on Kiribati (Rahmstorf Scenario). visible than they are now. 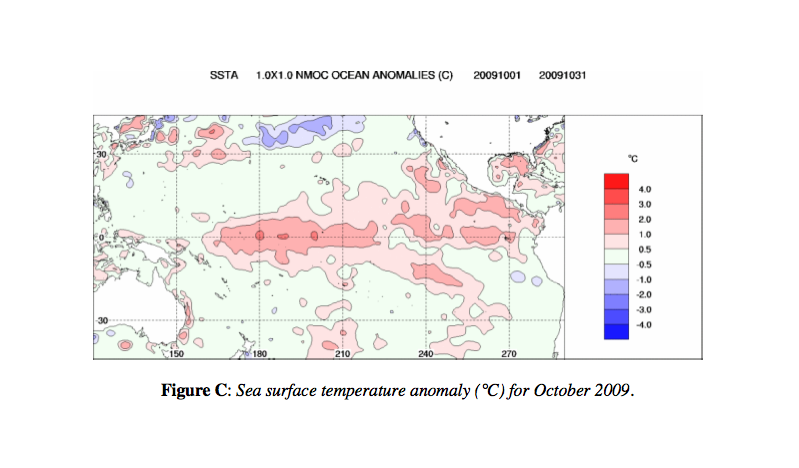 Picture: Data visualization showing the warmed surface temperatures of the equatorial regions of the Pacific Ocean. Kiribati is located on 0’180. Changes in rainfall patterns in addition to storm surges which lead to salt contamination of freshwater resources is the most immediate challenge for Kiribati. A 10% reduction in average rainfall by 2050 will reduce freshwater reserves on South Tarawa, Kiribati’s most populous island by a fifth. According to the World Bank report on climate change, Tarawa, the capital of Kiribati will be up to 54% inundated in the south and up to 80% in the north by 2050. Food supplies are also threatened by increased salinity. Food resources such as fresh water milkfish are no longer available and multitudes of plant life and vegetation are struggling to survive in increasingly salty waters. Taro, once the islands most abundant crop is increasingly killed by saline intrusion. Villagers do not have the option to search inland for more food and fresh water resources as the coral atolls and islands are slender in width and lay only 2 meters above sea level. Most traditional homes have raised floors to adapt to seasonal flooding. However, more frequent flooding has lead to erosion that threatens roads, buildings, and in some cases has forced people to relocate. Specifically on South Tarawa, the problems that come with increased urbanization such as squatters, improper waste management, unclear landowning rights issues are development issues that create barriers to adaptation to impacts of climate change. Carbon Dioxide emissions contributes the rise in the earth temperature and melting of the polar ice caps which raises the seal level Global warming is related to sea level rise which threatens the existence of all plants, animals and people living on Kiribati. Coastal erosion, seawater from storm surges, sea spray, and coral bleaching are the current observable impacts of climate change. Picture Top and Bottom: Former freshwater ponds on Abaiang flooded with sea water, killing coconut trees and milk fish. The Coconut Tree is the preferred agricultural tree as a cash crop yet as salination increases coconut trees in addition to other fruit trees are dying off and leaving i-Kiribati vulnerable to food security issues. According to a Ministry of Health and Medical Services report, there is an overal deterioation of Kiribati health. Three out of five children under the age of 10 suffer from Vitamin A deficiences and malnutrition. Currently there are no cases of violent conflict in Kiribati nationally or internationally. Any conflict that may occur is speculative and most likely attributed to the strain on the island as sea levels continue to rise. 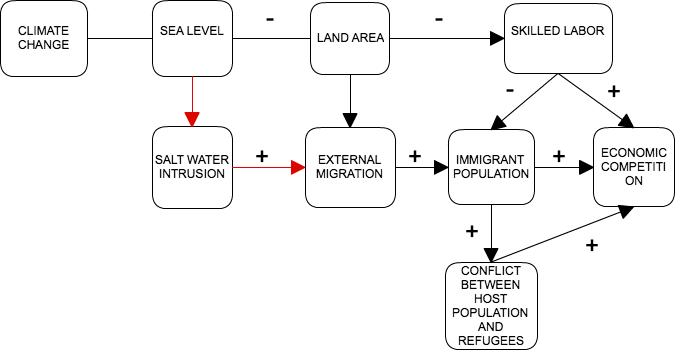 I-Kiribati (Kiribati citizens) may begin to start illegally migrating to other countries as climate refugees and conflict from those situations is likely. are given preference for jobs. In 2005 President Anote Tong suggested the need for nations to seriously consider Kiribati's option of relocation since other forms of adaptation may be too late for the country. The President is urging serious discussions on adaptation options including migration for the i-Kiribati. President Tong is hopeful in trying to persuade Australia and New Zealand in being more receptive to labor migration from Kiribati in years to come. Kiribati will absolutely require external assistance to be financially prepared for adaptation strategies. Traditional methods of adaptation have included preserving traditionally prepared foods and crops that were regarded with holding social values. However, many of those traditional practices have dissipated with the encroachment of globalization into the island's culture. 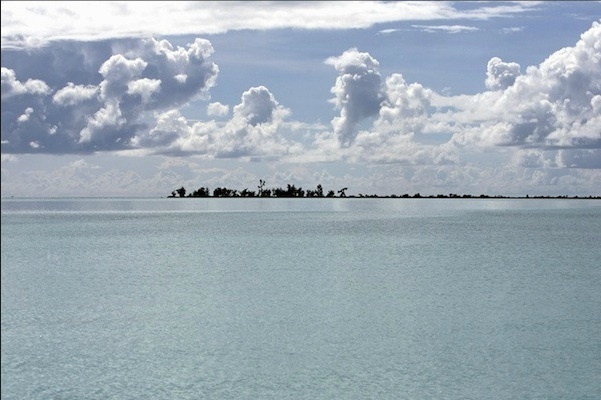 Several projects have been proposed with the aim to heighten Kiribati's level of preparedness against climate change.